Christmas holiday in 2007, my family and I traveled from Houston, TX to Boston, MA to be with family for the holidays. I was rushed to the hospital after several days of sickness that I just couldn’t recover from. I was immediately admitted with sky-high blood pressure and only 10% kidney function. Unknowingly, I had also lost a significant amount of blood over the preceding weeks through urination. I was diagnosed with ESRD – End Stage Renal Disease. From then on, I needed dialysis would be required three days a week. And, we knew, the only cure for kidney failure is a transplant. My brother, Don Davis, was a great match and agreed to be my living donor. On 04/15/08, I underwent a kidney transplant. My brother is an avid runner and has run the Boston Marathon many times. This year he would pass up his passion that year for my sake. 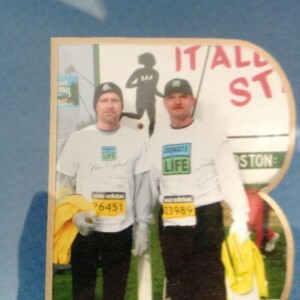 But,one year later, 04/15/09 my brother and I ran the Boston Marathon together and finished! We ran with the support of Donate Life in Massachusetts and were asked to join a parade in Massachusetts on the Donate Life Float post-surgery.